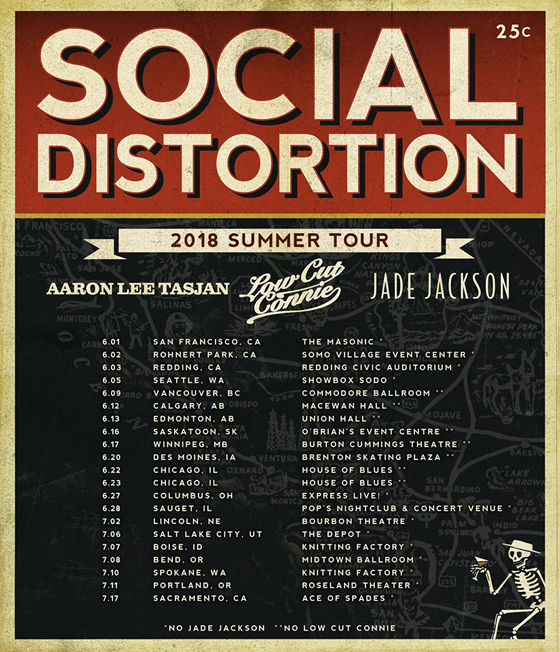 While it's been just over seven years since Social Distortion shared their Hard Times and Nursery Rhymes, the punk vets have now announced plans to hit the road on tour this summer. The North American trek will keep the band touring throughout June and July for a total of 21 dates, including a number north of the border. Support on the run will come from Aaron Lee Tasjan, Low Cut Connie and Jade Jackson. Fans in Western Canada will be able to catch the band as they make stops in Vancouver, Calgary, Edmonton, Saskatoon and Winnipeg. Tickets for all Canadian dates go on sale March 29 at 10 a.m. local time, while stubs for all other shows on the tour go on sale March 30 at 10 a.m. local time. In related news, former Social Distortion drummer Charlie Quintana sadly passed away earlier this month.